When we install a new system for someone, we know our customers will start saving money instantly. In fact, the energy savings is typically the main reason someone begins to consider a ductless system in the first place. However, we often don’t get to hear the real results numbers that our customers realize over the course of the heating season. Occasionally we will have someone call or email who is so thrilled with the comfort and savings that they are getting from their system that they just have to share. We love to get those stories and this is one we just have to pass on. The customer has a 1000 sq ft home, that is well insulated and had electric baseboard heat. We installed a Fujitsu 15 RL series Ductless System in her home. Since installation, she has been using this system exclusively to heat and cool her home. She pays her power bill on an average basis, paying the same amount each month, year round. At the time we installed her new Fujitsu Ductless Heat Pump, she was paying $195.00 a month. Now, after the installation of her new system, she is paying much less. The utility company has adjusted the amount of her average payment down from $195 per month to $113, saving her $82.00 per month. This monthly savings is significant and has been enough to make the customer very happy that she chose to go Ductless. She reports feeling more comfortable in her home and is also pleased with the ability to both heat and cool her home with the same system. 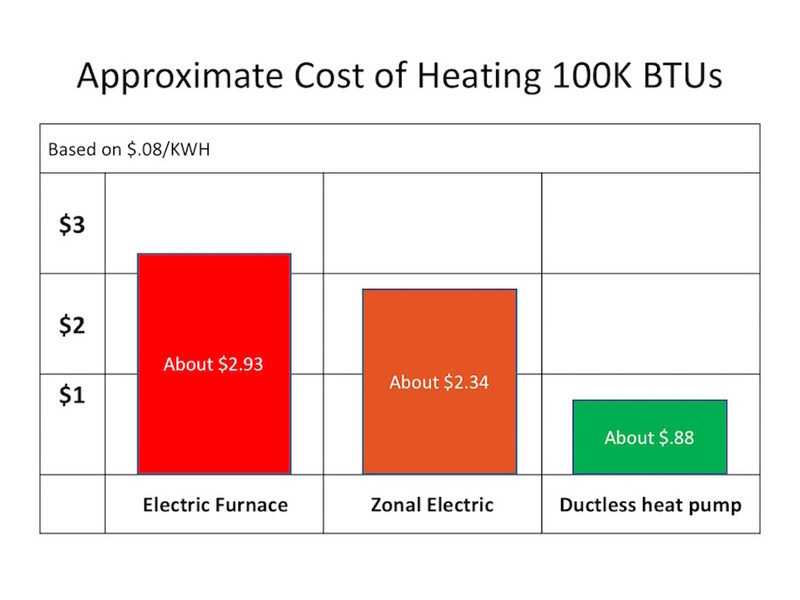 Using AC without increasing any energy costs, is icing on the cake! But, there is more. she was happy to let us know that she has run the numbers and determined that when she factors in her monthly utility savings and the money she saved at installation by taking advantage of her local utility rebate, that her new Ductless System will pay for itself in less than three years! We invite you to run the numbers on your system and see what you get. Math does not lie. And if you have a great Ductless Heat Pump savings story, call or send us an email and share. You can also post it on our Facebook page. We love to hear these happy endings!